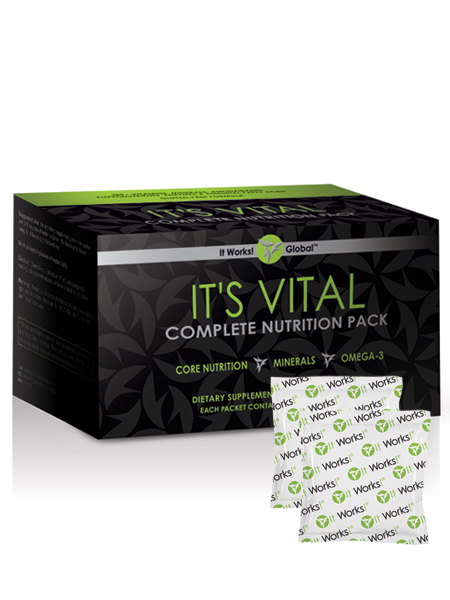 Meet all of your daily vital nutrition needs with the exception of Greens. All in a small packet- no guessing! It’s Vital™ Minerals: It’s Vital Minerals for strong bones, a healthy heart, and a well-nourished body. Powered by nutrient rich sea algae derived Aquamin®, a premium mineral blend. These sea minerals come from the most densified nutrition that you can get on the planet! It’s Vital™ Omega-3: Omega 3, a fish oil vital for heart health & support for the mind, joints, hair, skin and nails. Also contains a purifying rosemary-based antioxidant blend to fight free radicals found everywhere; we can’t avoid them but we can take products that have properties that fight them! It’s Vital™ Core Nutrition: Our It’s Vital is made with whole food ingredients. Nothing artificial. No chemicals. Our It’s Vital has 70+ BIOAVAILBLE ingredients. Superior absorption within the body- so your body is actually getting all of the vitamins, minerals and phytonutrients it needs on a daily basis to have optimal health.